The global cosmetic lasers market can be segmented based on product, modality, application, end-user, and region. Based on product, the global cosmetic lasers market has been bifurcated into Nd:YAG, diode, carbon dioxide, Er:YAG, pulse-dyed laser (PDL), and others. The others segment is expected to expand at a rapid CAGR in the coming years. Some of the technologies utilized in this segment include Q-Switched, intense pulse light (IPL), high-power optically pumped semiconductor (HOPSL) lasers, infrared lasers or IR lasers, and others. The Nd:YAG segment dominated the global cosmetic laser market in 2017. In terms of modality, the global cosmetic laser market has been segmented into standalone and multiplatform. In terms of both CAGR and revenue, the multiplatform segment dominated the market in 2017, It accounted for 15.1% market share and was valued at US$ 1,042.7 Mn in the same year. Rise in the preference for devices with the capability to treat multiple conditions has been a major driver of this segment. Based on application, the global cosmetic laser market has been classified into hair removal, skin resurfacing, vascular lesions, scar & acne removal, body contouring, and others. The scar & acne removal segment includes treatments for the removal of various forms of scars such as age spots, sun damage, melisma, and so on. The segment was valued at US$ 570.7 Mn in 2017. It is expected to expand at a robust CAGR during the forecast period. In terms of end-user, the global cosmetic laser market has been divided into hospitals, dermatology clinics, and medical spas. In terms of revenue, the dermatology clinics segment dominated the market in 2017. Better availability of facilities, technology and professional consultancy, and lower hospitalization time are few of the factors responsible for the growth of this segment. Moreover, the segment is anticipated to expand at a rapid CAGR during the forecast period. 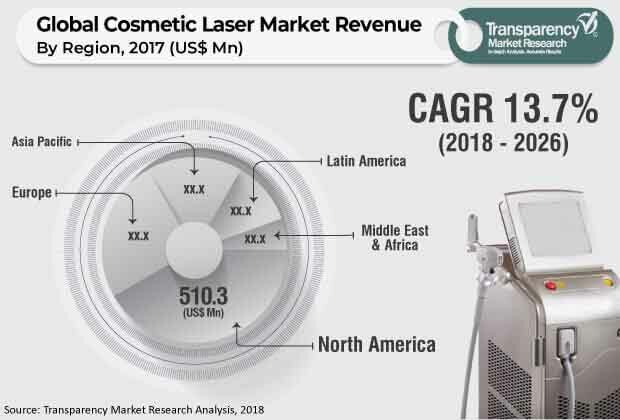 In terms of region, the global cosmetic laser market has been segmented into North America, Europe, Asia Pacific, Latin America, and Middle East & Africa. North America dominated the market in 2017. Availability of a wide range of treatment options and continual expansion of the cosmetic industry are boosting the cosmetic laser market in North America. Technological advancements and increase in preference for minimally invasive cosmetic procedures are expected to propel the cosmetic laser market in Europe. Rise in medical tourism, increase in awareness regarding benefits of laser procedures, and increase in population are a few of the major factors driving the market in Asia Pacific. The market in Asia Pacific is expected to expand at a rapid growth rate during the forecast period. It is expected to expand at a CAGR of 14.1% in the next few years. The market in Latin America is expected to be driven by a high number of cosmetic procedures that are performed in this region and beneficial laws supporting the growth of medical tourism industry. Additionally, a rise in awareness regarding the usefulness of laser procedures for cosmetic treatments is expected to augment the market in Latin America during the forecast period. Major players operating in the global cosmetic laser market include Aerolase Corp., Shanghai, Fosun Pharmaceutical?Group?Co., Ltd., Solta Medical, Cutera, Hologic Inc., Lumenis, Sciton, Inc., SharpLight Technologies Inc, Syneron Medical Ltd., and El.En. S.p.A.